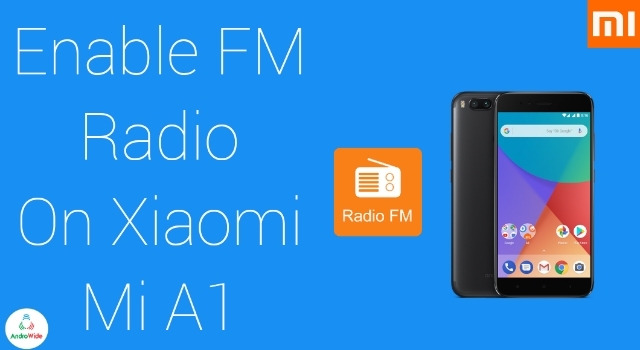 Hi guys in today's post I will be showing you that how to enable or activate FM radio on Xiaomi Mi A1 device, as we all know Xiaomi has partnered with Google under Android one program and launched their first first Android phone Xiaomi Mi A1 in the Global market, and they have disabled FM radio app on this device because of some issues in countries like US and Canada, but we can activate FM radio on Xiaomi Mi A1 by using a simple trick which I am going to show you. Now Just Scroll Down to the Bottom and Your will find FMRadio option, Just tap on that, and it will ask to insert earphone, just plug in the earphone and navigate the channels with the backward and forward button appeared on your device. Now open the activity launcher, on top left side of this app you'll find Android logo and recent activities, just tap on recent activities and click on all activities. Now it will display you all the activities of your Mi A1 device. Now scroll down a bit and you will find an option called factorykit test, just click on that and you will find 5 activities. Now it will display you some options, just click on create activity and it will create an activity on your Xiaomi Mi A1’s screen. Just open Factory kit test and you will find many hardware test over there, now scroll down to the bottom and click on FM radio, now it will ask you to insert the headphone and after that it will display frequencies along with forward and backward button. Pro Tip : H/W Test Mode does not support volume controls, so make sure to adjust the volume before going into H/W Test mode, or after hearing sound go back and adjust the sound. Hopefully Xiaomi will release a FM app at least for India very soon. If you are still facing any issues on your Xiaomi Mi A1 device please comment down below, and do follow androwide on social media and subscribe our YouTube channel too.